A series is defined as “a number of things, events, or people of a similar kind or related nature coming one after another.” When Hello Storyteller approached me back in March to write a guest blog post, Megan suggested that I give a little lesson on my crib series. I knew that by the time we shared this blog post, there was a very good chance that he might not be napping much anymore! 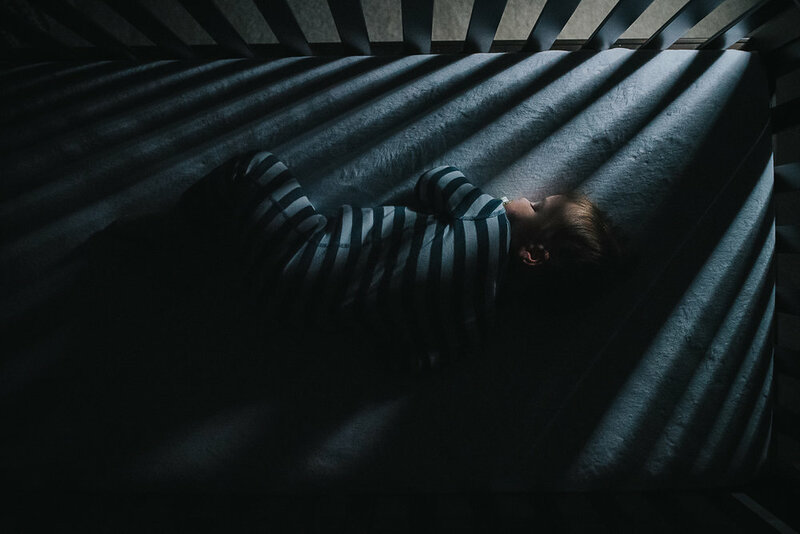 He actually isn’t in a crib now, but I still wanted to devote my blog post to #ourcribstories and write about his naptime series. 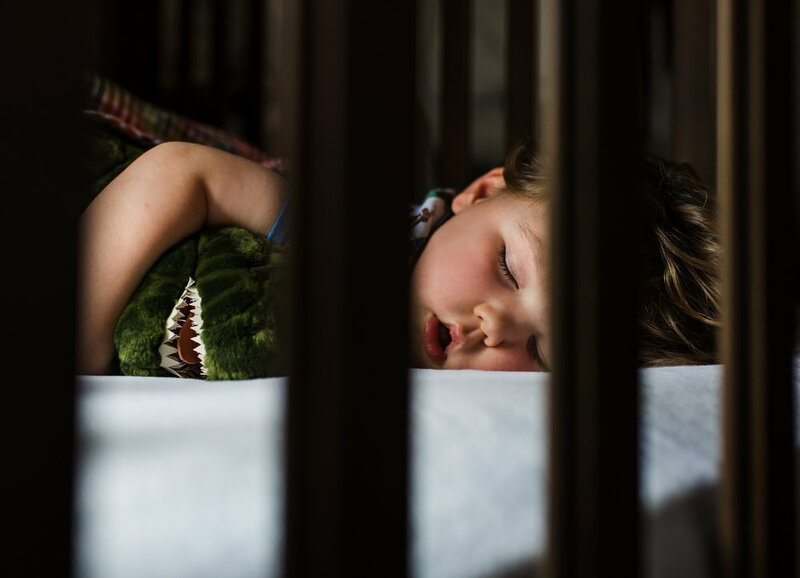 The idea of photographing my son sleeping was triggered by an article I read when my son was approaching his first birthday. It suggested that one of the things you should do for your child is to take a photo of them sleeping the night before their birthday as a tradition to commemorate their “last night as a” baby, or 1/2/3-year-old, etc. I have taken those images so far, however, this totally evolved into something else for me after joining Instagram. I feel like I cannot continue to discuss this subject until I acknowledge that this particular series was one hundred percent influenced by the work of @meg_nlo and @lauries_little_ones. When I saw their sleepy images of their sons from above, I was completely in love. I was totally inspired to create my own versions of the images they created. 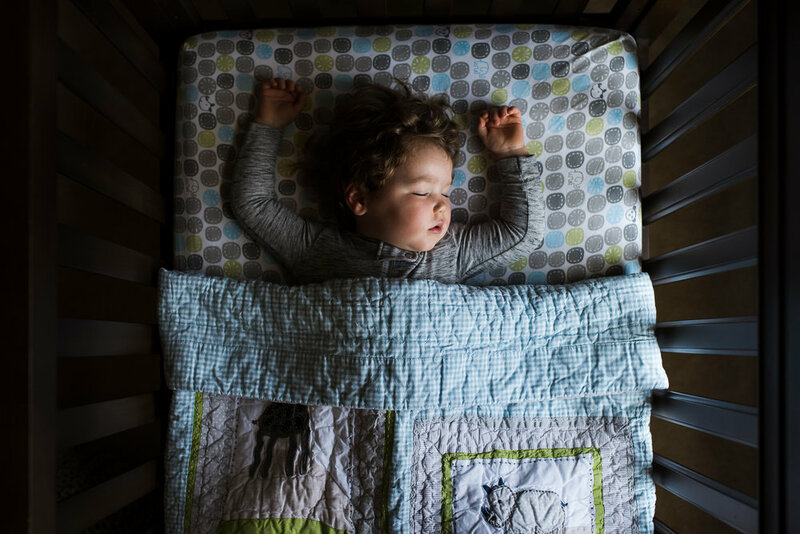 I knew I wanted to put my own spin on it, so I shot images of my son during naptime for maybe 18-24 months of his life but committed to photographing him from as many perspectives as I could think of including from high above him in the crib. As a working mom, the lion’s share of the time I get to spend with my son is on the weekends. A big part of his day for 3+ years of his life was obviously spent napping, so I decided that sharing and documenting this part of our story was something extremely meaningful to me. It was my first real attempt at creating a “series” and some of my absolute favorite images of him came from this collection. 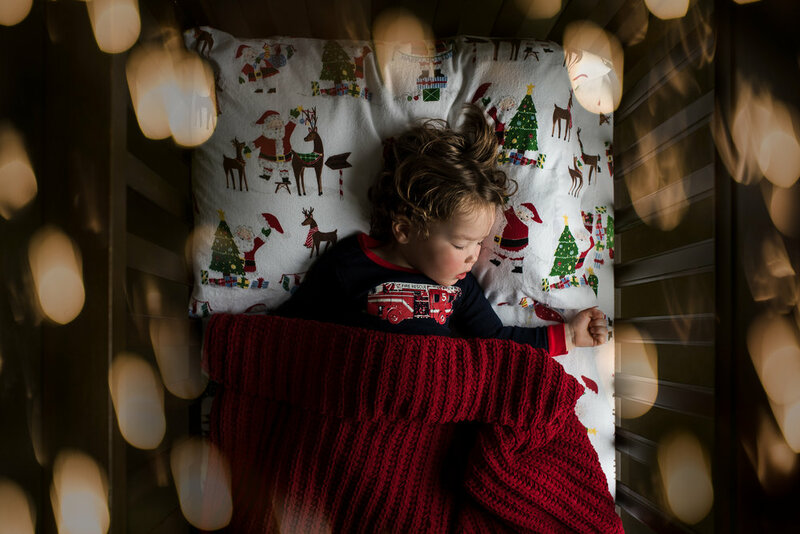 I’ve received so many comments about my naptime images, mainly about how moms were so jealous that my son would sleep through these photo sessions. I am fully aware that I got extremely lucky with a sound sleeper, but I will share some of my tips on how I went about shooting my images which might help some of you! My son liked to be held until he fell asleep, so I was always WITH him when dozed off. My son slept very soundly in the first 20-30 minutes of his nap, so that was the time to strike. Most of my crib sessions were very short! I could move him without waking him up, so sometimes that would include me turning his face towards the light from the window, or moving him from his stomach to his back. I always got my gear into the room before we started to get ready for nap. So that meant that my camera, lenses, tripod, stool and anything else I needed was in the room so I wouldn’t make any additional noise going in and out of the door. My son falls asleep best in a dark room, so we have blackout shades. He also listens to white noise, which I think helped drown out the sounds of my shutter and my movement around the crib. My crib is super sturdy and the rails are about 4” thick. I have great balance (thank you, yoga!) and would never have attempted this if I wasn’t confident that I could safely balance myself on the crib rails. Please be safe if you try what I did. A ladder and using live view is also an option. I always checked to ensure that my camera strap was secure before shooting. Blackout shades help you control the light. I could let more (or less) light in the room depending on what I wanted to shoot. Sometimes I wanted to create deep shadows with very little light coming from the window and practice low light, so I would only let a sliver of light come through. Sometimes I wanted a bright and airy room and I would open the curtains wide. I liked to play with props around the holidays. Try cute blankets and textures. I have created double exposures, shot through a dryer sheet, practiced freelensing and decorated his crib with pumpkins in the fall or Christmas lights (and dismantled them right after) all during my son’s naptime. Try shooting from above, try different crops, shoot from the top, the side, the ends of the crib, use the rails to frame your subject or isolate your baby’s sweet mouth or precious eyelashes. If you aren’t getting the light you want, move the crib! If you need to slide the crib to another part of the room to get better light on the child, by all means, do it! 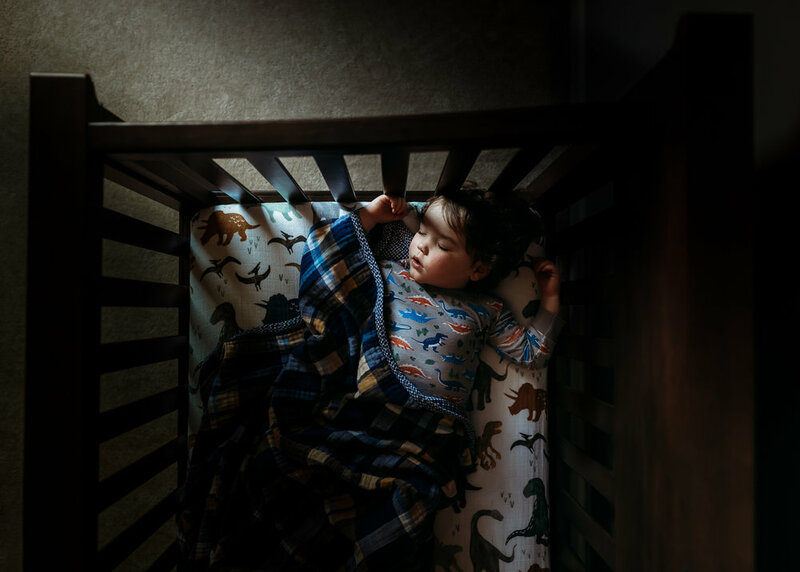 I could slide my son’s crib around while he was asleep and he wouldn’t even notice that we moved…but you know your child best so if you have to move to better light before the nap starts, do that! Embrace the noise & slow your shutter. Don’t be afraid to use a higher ISO. You can play with noise reduction in post processing. Also, your subject isn’t moving when they sleep, so don’t hesitate to drop your shutter speed down. I think I shot as low as 1/30 sec in low light with my tripod so that I could maintain a comfortable ISO. I also typically shot wide open in most situations. Use live view, but zoom in to focus! When shooting at a lower aperture, sometimes it was hard to achieve focus so I discovered that you can zoom in so you can get a better look at your focus before clicking that shutter button. So many people I admire have created some amazing series. Some ideas you can try: You can create your own series of images shot with a particular lens, lovey, toy, location in your house, special location away from home, a costume. Anything you shoot regularly can become a collection. You could start a special drone series, or a series that includes all of your children in the frame. The crib series is definitely the series I have with the most images, but I also get in the frame with my son a lot or I put him in animal bonnets. I have had a bubble series and series of images shot in our playroom. Have fun and I seriously can’t wait to see what you come up with. Give it a hashtag so you can see your images together when you search social media. Tag me in your comments so I can see your sweet, sleepy images or your brand new series! !